Sometimes people deal with clutter using the easy way –and what can be easier than keeping clutter in a storage container without having to think of organizing or presenting every single object neatly. But sometimes the type of container we use does not really solves the problem, instead it only gives the clutter a place to hide – and not in a stylish presentable way. Imagine life without storage containers, without baskets or magazine racks. Our homes would probably feel like a salad of clutter. However when we use storage containers, we shouldn’t just settle for the ones with a lid that closes. We should take into consideration the other reasons why we use storage containers. The very first reason we use storage containers is so we have a designated place where we can keep our things. Less clutter or, no clutter at all makes any area look more spacious and breathable. We always want a feel of openness in every area of our homes and we use these containers to keep everything neatly. We put objects in the container to also to take care of them. We should also choose containers that are big and spacious enough for the things we intend to put in them. In the same way, we should only put appropriate things in these storage containers and make them carry the right amount of things so we can take care of the containers too. The containers themselves should also be presentable. Remember that another reason why we are going for containers is so we can make the rest of the room presentable. We should not only think of the things we keep but the effect of the clutter on the rest of the room. We should choose containers that are also stylish. This is so other people will not have an impression that the container is used for keeping clutter that we don’t have time to organize, and so that these containers can look appropriate in any room. Instead of looking like the containers are just for hiding something, it should also look stylish enough to give the room an added decorative value. Another tip for choosing storage containers is to choose something unique. It would be a really wise idea to use containers that look like you’re showing off your belongings at home rather than hiding them. Of course, no would want other people to think that they have a hard time cleaning up their own clutter at home. 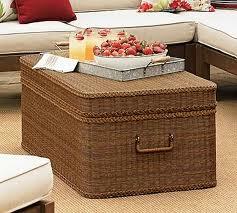 The wicker storage is a great example of a stylish and useful storage container. It is made from authentic material so it’s naturally stylish. It is not as opaque or see-through like the plastic ones so even if you don’t have time to neatly keep your things in the wicker storage it won’t be noticeable. The wicker storage can provide your organizing and decorative needs at the same time. The storage will keep the clutter off turning something embarrassing into an attraction in any room in the house.